Little Grey Bori, was wondering all about. He had lost his owner, that was without a doubt! His friends were checked into the hotel, but somehow he was forgot. Now he wandered around Neopia, wondering why he was left out. Traveling here and there, Little Grey Bori continued his search - he stopped by the money tree first, for any clues of the sort. "Have you seen my owner?" Little Grey Bori asked, with a frown on his face. He looked sad and depressed, his feelings all over the place. "No, I haven't" The tree said with a smile, "But perhaps this will cheer you up, instead?" He handed the Little Grey Bori a discarded plushie, which Little Grey Bori stared at blankly. He dropped the plushie and turned away, his head sinking down low. He didn't want to play or smile - he just wanted to be home. His heart skipped a beat as he noticed a few stores to check out, hopefully she'd be there! He scampered inside the Petpet shop, looking everywhere. "Can I help you find something?" A pretty Usual approached, a smile on her face. "I'm trying to find my owner! Can't you see? I've been left behind, forgotten, abandoned maybe!" Little Grey Bori sobbed, his heart starting to ache. "Oh my, that's no good, for goodness sake! Did you check Roo Island? That's not too far from here. I know lots of Neopians take their Petpets there!" She offered a hopeful smile as she patted Little Grey Bori on the back. "Here, take this with you - Maybe he can help you find your owner!" She handed him a brand new Petpet, that sparkled with joy, much greater than a toy. It was a Feepit, and boy, did he want to keep it. "I just can't do that, my owner makes those decisions. I will come back and we can take him home then." Little Grey Bori continued to frown, his color showing much more than ever before. It was as though a rain cloud was following the Little Grey Bori around as he wandered towards Roo Island, wondering if he'd ever see his owner again. He was very disappointed and feeling ashamed. How was he forgotten? What had changed? Roo Island was packed, and boy did it look fun. Little Grey Bori couldn't even smile, as he watched everyone with their 'some-one'. He was alone, with no one to play with, and there was only one place for him: The Pound was a place he'd never want to end up, oh no, not him. Scurrying about he didn't want to be spotted, surly they'd throw him out like some garbage! He watched Neopians play with their pets, dancing and shopping, coloring and bouncing! It looked so fun, but Little Grey Bori didn't even smile. He was full of sadness, and couldn't stand the pain. "Oh this just won't work." He said with a frown. "She isn't here, she isn't there.. she isn't anywhere!" "Hey you! Where is your owner?" A Red Grarrl approached Little Grey Bori. Little Grey Bori tried to fight, but he had no proof of his owner being in sight. He tried to run but he wasn't fast enough, the Red Grarrl was much too strong, Little Grey Bori just accepted he didn't belong. The ride to the Pound was long and depressing, Little Grey Bori kept his head down low, obviously stressing. The Pound was a place he never wanted to end up, not to mention being away from his owner whom he loved so so much. The Pound was terrible, cold and dark. Little Grey Bori sat there, Listening to others whine, growl, and bark. He was quiet and sad, watching Neopians walk by. No one wanted a Little Grey Bori, and he knew exactly why. He was sad and slumped over, which was no fun at all. He wasn't playful or happy, not something an owner would want. Instead he slumped into a pile, wondering how he'd find his owner again. Would they ever be together once more? It felt like days had passed and Little Grey Bori sat - until a familiar sound came from down the halls. "But he's not grey, that couldn't possibly be him." Said the voice. "I painted him Speckled before I checked him in!" Little Grey Bori lifted his head up, the sound had sounded like a bunch of luck. Could it be her? Was it his owner? Had she finally found him? He walked to the front of his cell, looking down the hallway, wanting to give her a yell. "That's him, that's the one! That's my Little Speckled Bori!" She said, falling to his side and reaching through the bars. She gave him a squeeze and his tail finally wagged, a tiny bit of happiness showing although he looked sad. "What happened to you? Why aren't you at the hotel?" She asked her Bori. She turned to the Techno and frowned, "You have to give him back!" "That will be 305 Neopoints." The Techno said, his eyes wide and yellow, staring with an evil glare. Shuffling through her bag, Little Grey Bori watched with delight as she managed to count out her points. Handing them over was the key to his freedom, and he couldn't believe it was time to be free. She's here, she's back! He just couldn't believe it. But where had she gone? "Come on, I have something to show you!" She smiled, dragging her friend out of the Pound. "Let's go quick, I just can't wait." The two traveled far from the Pound, Little Grey Bori as happy as a Grey Bori could be. His owner pulled out a map, following it diligently until suddenly they appeared at a strange machine. "Now stand here!" She said, leaving her friend behind. Little Grey Bori looked confused and scared, not knowing how to feel. "Are you sure you want to zap him?" A mysterious voice asked, as the owner gave consent. Before Little Grey Bori could go, he felt a strange sensation take over him. Looking down Little Grey Bori was shocked. He wasn't grey anymore! Or.. a Bori. He looked up at his owner, who danced with delight. "Yes! Perfect! The Secret Lab worked!" She cheered, even though her Neopet didn't seem too thrilled. "Oh come on, Pink looks good on you!" She giggled, "And Unis are cool." She reached out and hugged the Neopet, who couldn't believe what had happened. Little Pink Uni hugged his owner back, feeling strange in this new form. He didn't know if he liked it, but he smiled to himself. It made his owner happy, and he was back with her again. Surely this would be fine, he could get used to the trend. "Come on, let's go play! You're my favorite Neopet ever!" His owner said, making him smile bigger than ever before. 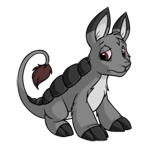 His new tail wagged as he walked, not even caring that he was the girliest Neopet around. It made his owner happy and he was back where he belonged: Not to mention, his friends were still in the hotel, and here he was, playing with his owner again.